Spring is in the air and sweet spring candies and treats are calling my name! 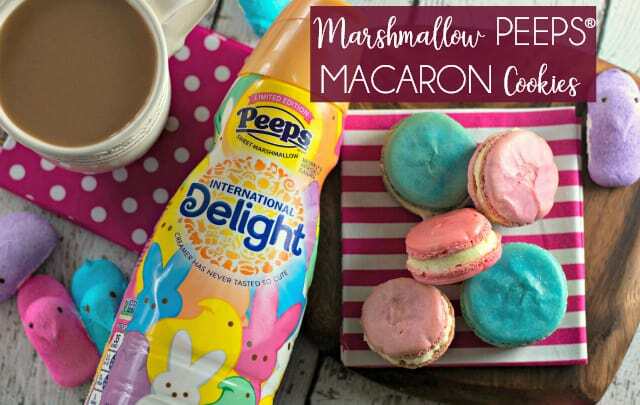 I used one of my most favorite coffee creamers to add the amazing marshmallow flavor to my Marshmallow PEEPS® Macaron Cookies: International Delight® PEEPS® Sweet Marshmallow Coffee Creamer. Ya’ll… it’s so good! It’s like adding melted marshmallows and cream to your coffee. Making macarons is something that has always both intrigued and intimidated me. Do you feel the same way? 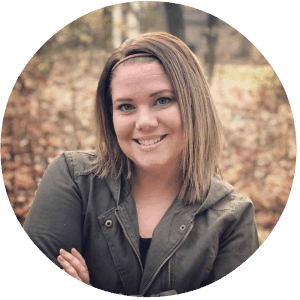 I have to tell you, it’s easier than you might think! 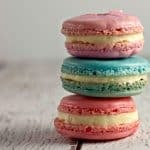 My macarons are not magazine perfect. There are some little crinkles here and there. But who cares? 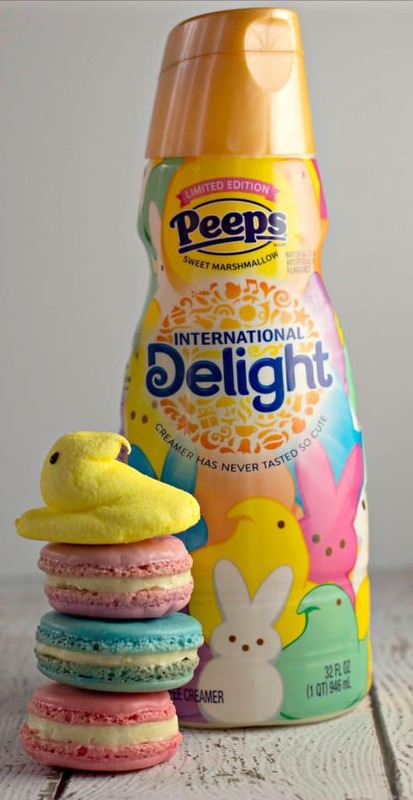 Certainly not my husband when he tasted one of these Marshmallow PEEPS® Macaron Cookies and exclaimed, “BABE! 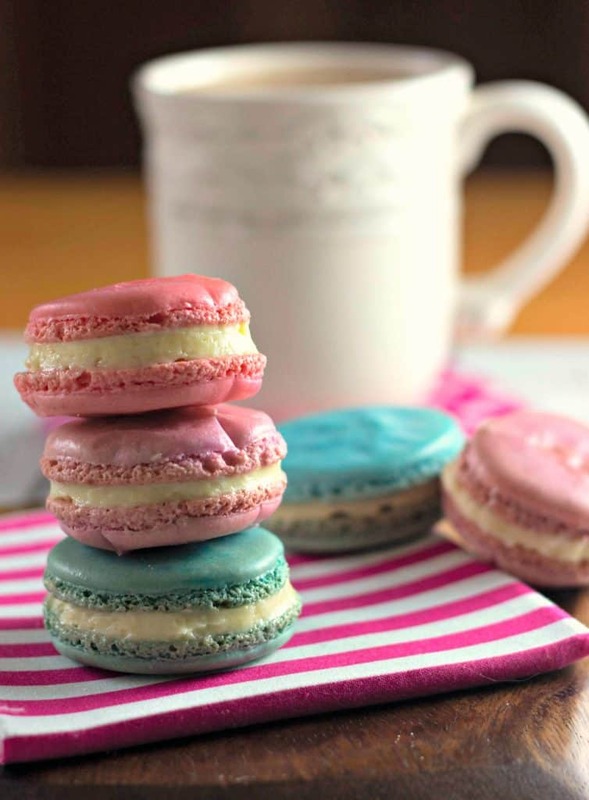 These are better than the macarons we got at the cafe!” Really… so delish! 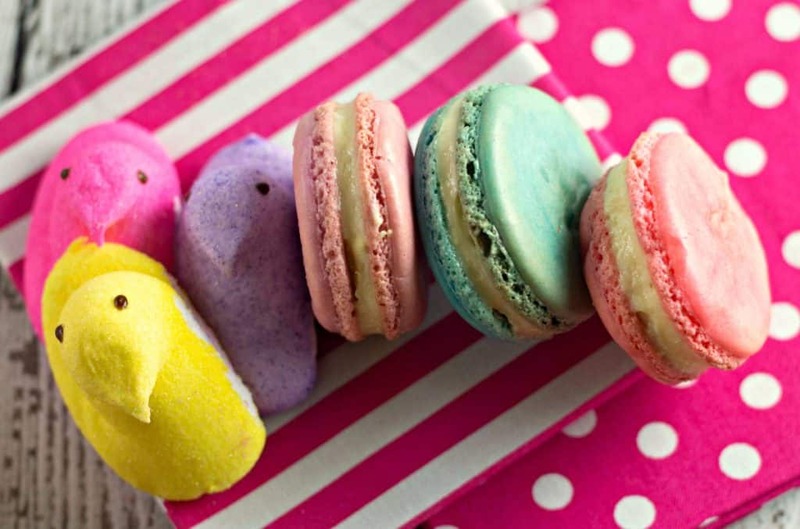 Don’t let the oh-so-delicate macaron scare you away. 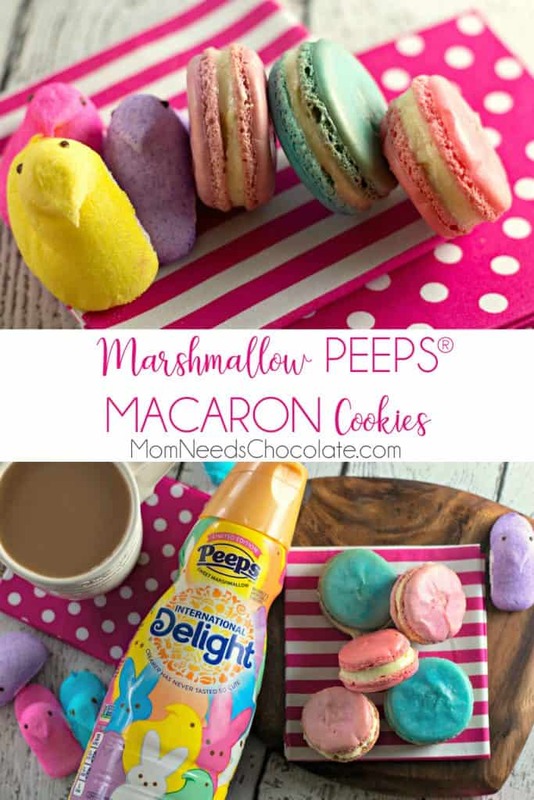 You will totally rock at making these tasty Marshmallow PEEPS® Macaron Cookies this spring. 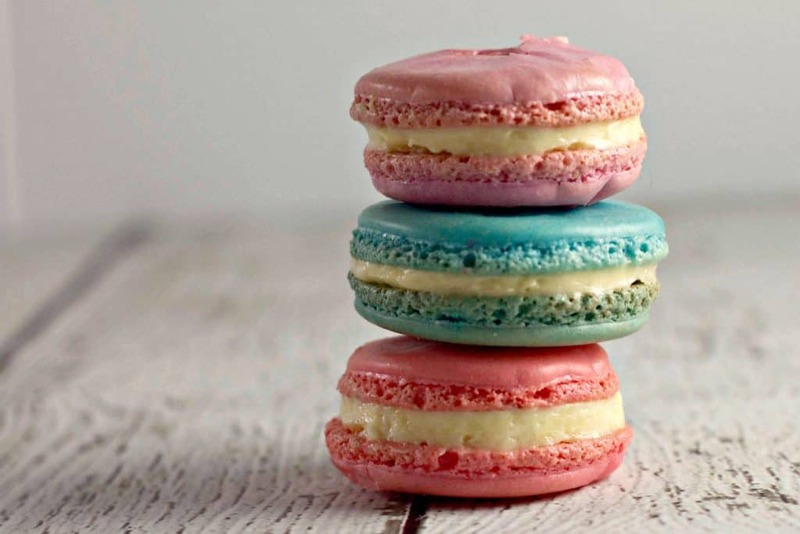 You’ll need a few important tools to make macarons – no exceptions. 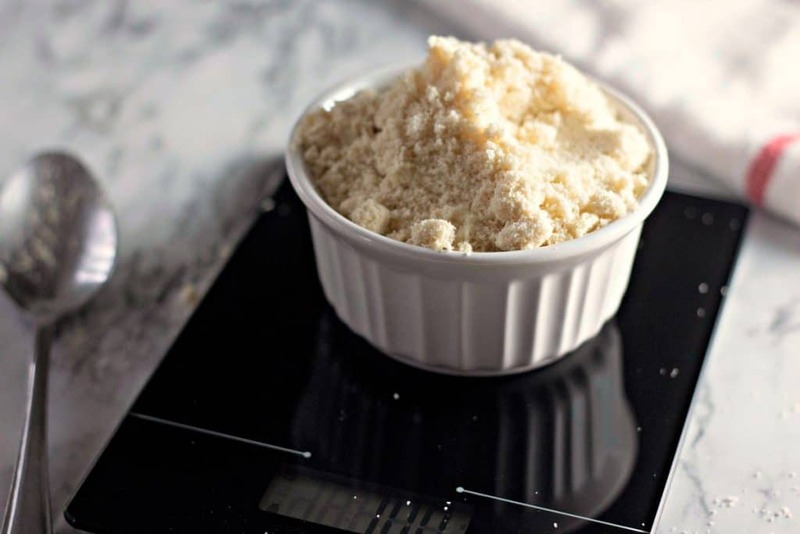 Digital scale – all ingredients MUST be weighed in grams. 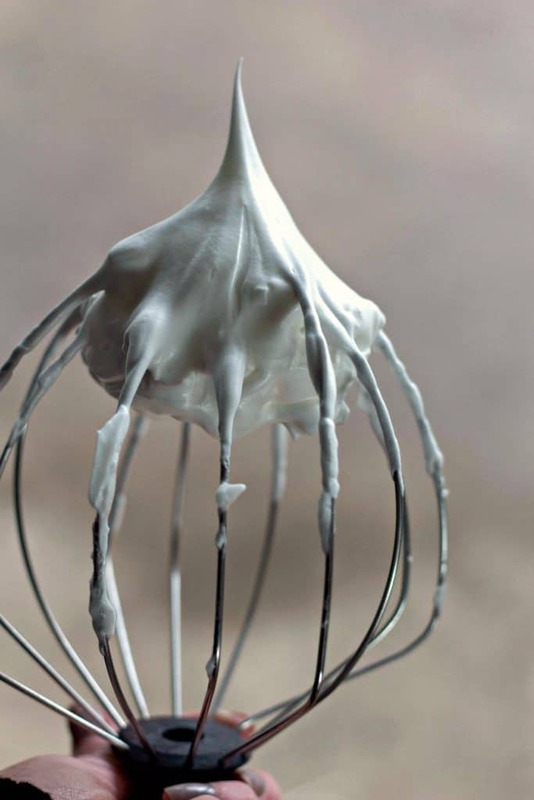 An electric mixer – beating the egg whites takes a bit of time, so I love using a stand mixer for this. Sifter – it is important to sift the dry ingredients very well to avoid lumps and bad texture. Parchment paper or a silicone baking mat – I used parchment paper. 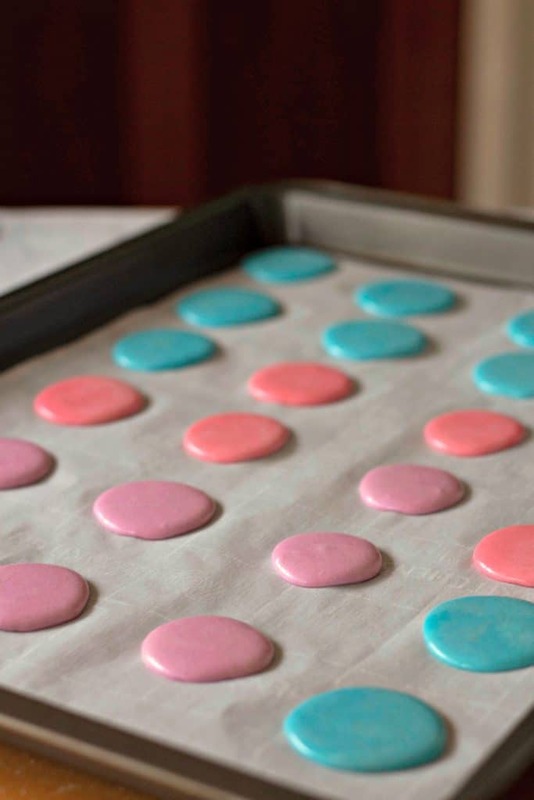 Piping bag – you really do have to pipe the macaron batter onto the cookie sheet. A scoop just doesn’t work well for these cookies. I recommend using extra fine almond flour. You’ll want to weigh it exactly to get just the right amount. 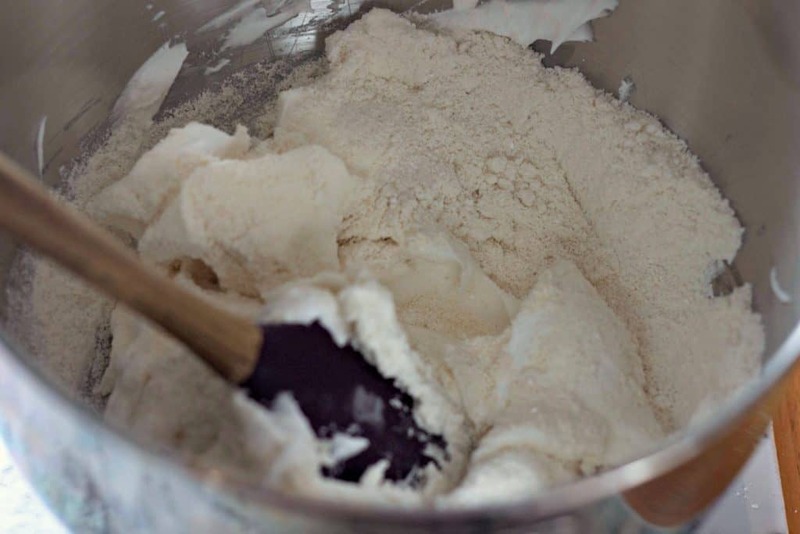 The almond flour will need to be sifted together with the powdered sugar to avoid any lumps. I used my stand mixer to beat the egg whites, cream of tartar, and sugar into a stiff, fluffy consistency. Then it was time to mix the almond flour and powdered sugar into the egg whites. This part takes some elbow grease! Perfectly mixing your cookies is probably one of the most important parts of making macarons. 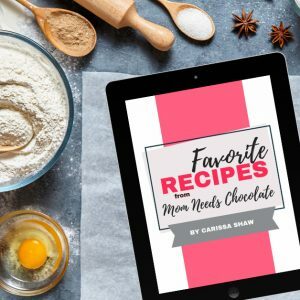 You will use the “folding” method to mix the batter. 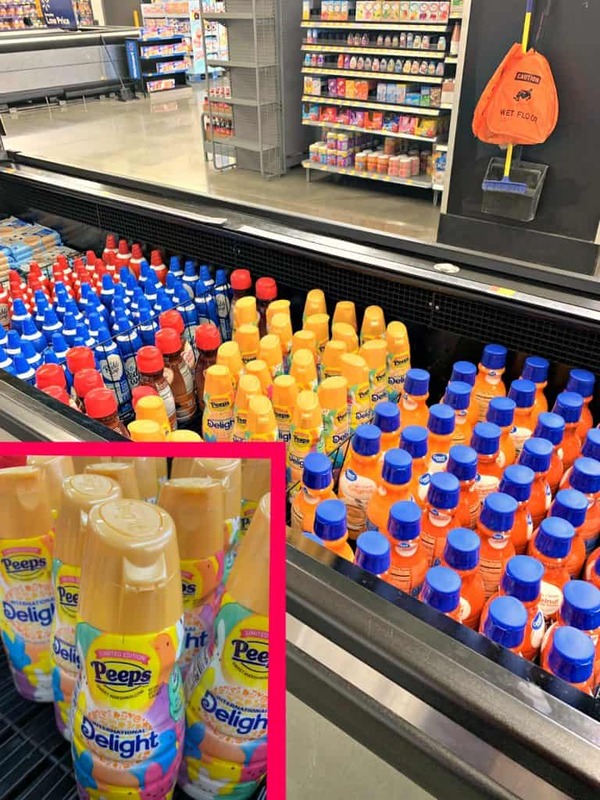 At first, it will be very grainy and thick. Keep folding the batter and even work it a little bit on the bottom and sides of the bowl with your spatula. Once the batter is thin enough to drizzle in a figure 8 pattern, you’re done. You can also test the batter by spooning a bit onto a plate and tapping it a few times on the counter. It should spread nicely into a slightly flat round of batter with no lumps. I also recommend you add the food coloring to your egg whites while beating them. I opted to divide my batter into three small bowls to have three different colors. 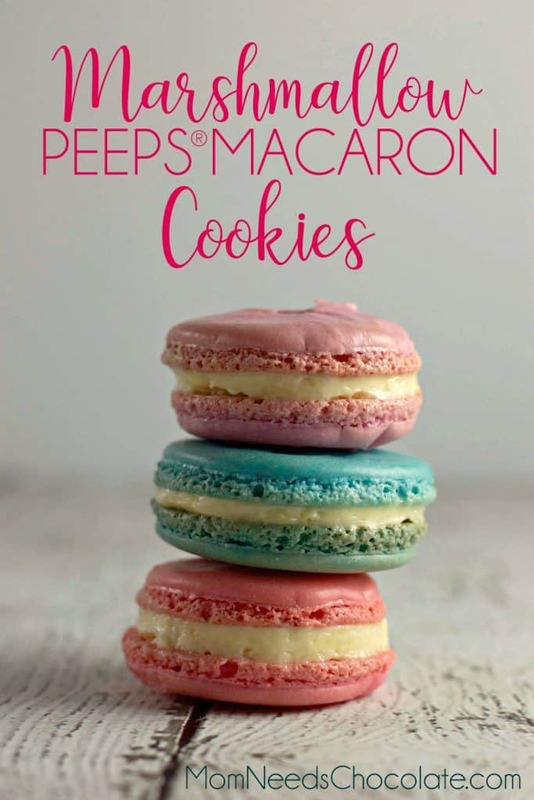 This is fine to do, but it does cause the tops of the macarons to be a little less smooth. Still, if you want three colors from one batch, this will work. Only use a tiny amount of food coloring. You are adding more moisture with the food coloring, and that can have a big impact on such a delicate cookie. 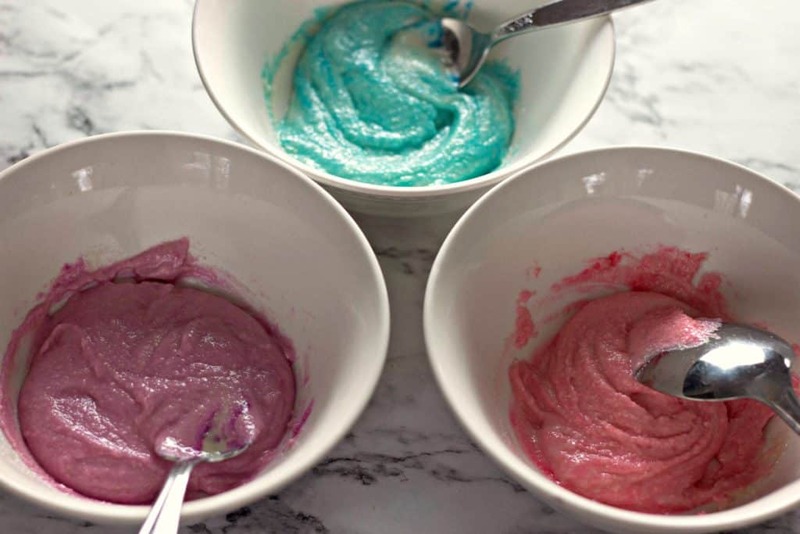 Be sure to stir as little as possible if adding coloring to the finished batter. As mentioned, over mixing the batter is not a good thing for macarons! Pipe the batter onto a silicone baking mat or parchment paper lined baking sheet. The smaller the better! I made all of my cookies about 1.5 inches wide. After piping the batter onto the cookie sheet, give it a few really good taps on the counter. Actually, “tap” doesn’t sound aggressive enough! Really hit the sheet good and hard on the counter to be sure any air bubbles are pushed out. If you see any come to the surface, use a toothpick to remove them. Finally, you’ll allow the cookies to sit on the counter and dry before baking. You should be able to very lightly touch the top of the cookies and not have any batter transfer to your fingers. 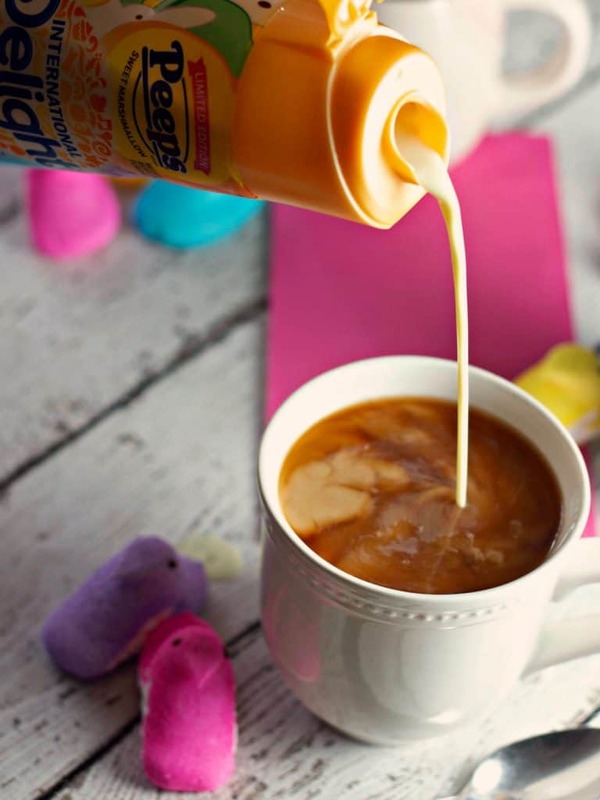 After baking, cool the cookies and spread on a generous layer of marshmallow PEEPS® sweet butter cream. It’s soooooo good! I’m not a big frosting person, but this stuff rocks. 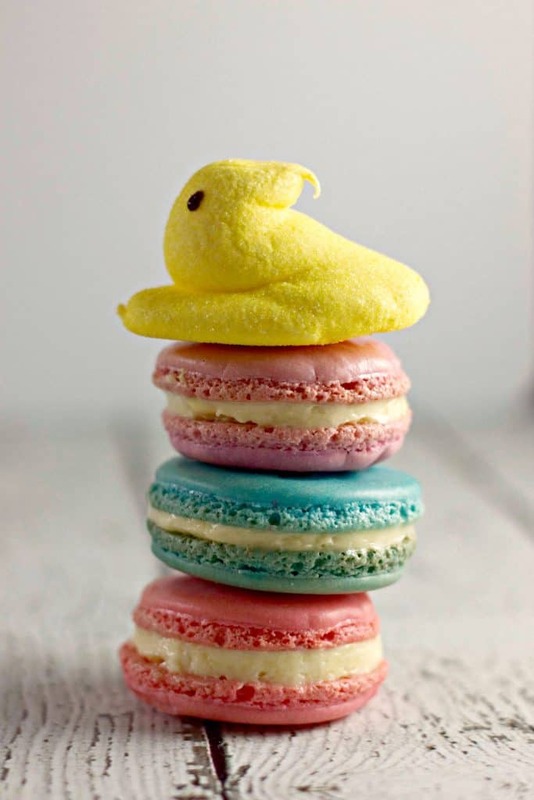 I’m eating one of these amazing little Marshmallow PEEPS® Macaron Cookies right now and it makes me so happy! I’m intimidated by these too but they are so so so darling! Going to be brave and try em.